Generation Citizen’s Policy and Advocacy Team is thrilled to be launching a report, “Through an Action Civics Lens: Policy and Advocacy to Support Effective Civics Education Across the 50 States” in tandem with our 2018-2019 Policy and Advocacy Agenda. You can find the Report here and the Agenda here. This call to action has not, in decades, seemed as urgent as it does today at a time when the very future of our republic appears at risk. 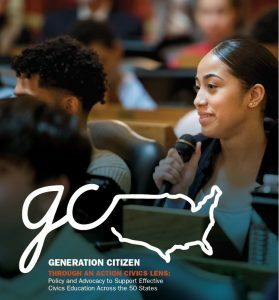 Since its launch in 2016, Generation Citizen’s Policy and Advocacy Department has engaged in comprehensive policy and field building research, spoken with diverse policy and education experts, and critically evaluated civics education policy across the country. Through the process, we have developed an understanding of the best practices for civics education policy and the diverse levers and stakeholders necessary for influence. We have applied this expertise to our work with state-level legislators and administrators to shape and implement policies informed by these best practices and led coalition advocacy to ensure their passage and equitable and sustainable implementation. This work has informed Generation Citizen’s annual Policy and Advocacy Agenda which outlines our Action Civics policy principles and positions and serves as a tool and starting point for shaping state-based policy agendas, and as a yardstick for evaluating and determining our organization’s stance on any given policy. The current demand for improved state civics education policy that has emerged over the past couple of years, requires that the field provide more resources, policy examples, and guidance for state policymakers, educators, and advocates alike. Through an Action Civics Lens is intended to be a resource for policymakers and civics education advocates across states to identify strategic areas which are best poised to provide a student-focused, experiential civics education: Action Civics. It is intended to catalyze discussion on the specific pedagogies, teacher support, funding, standards and frameworks, and assessment mechanisms which can prepare students as civic actors ready to participate in a sustainable, equitable 21st century democracy. We encourage state-level coalitions of policymakers, parents, students, educators, civics education organizations, and other stakeholders to consider, disseminate, and implement the insights posited in this report.